Do you remember this block of the Crestwood neighborhood south of UMKC? 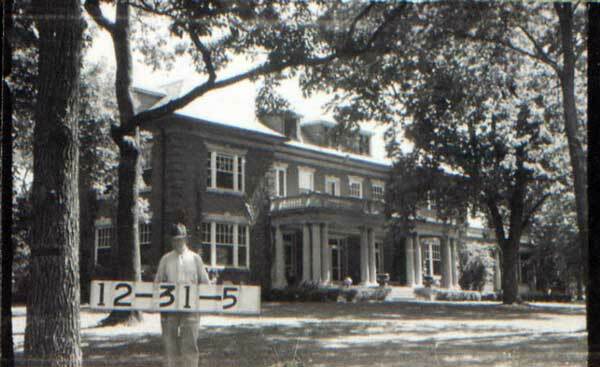 The Herbert and Linda Hall residence at 5109 Cherry in 1940. When J.C. Nichols developed the Crestwood neighborhood beginning in 1919, it was advertised as a “garden home” district. The neighborhood offered large lots taking advantage of the natural topography, and attracted wealthy residents moving south as the older, more mature parts of Midtown became crowded. As part of our Uncovering History Project, the Midtown KC Post is taking a look at the 1940 tax assessment photos of each block in Midtown. This week we’re focusing on the blocks from 51st Street to 54th Street, from Holmes to Cherry. (Many people seem confused by the tax assessment photos, which all include a man holding a sign. Here’s the story behind them). These two blocks of Crestwood are a good example of the type of development that occurred at the end of the building of Midtown. 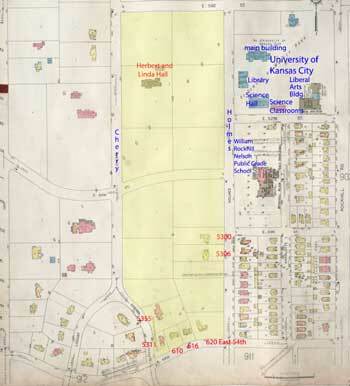 They also offer a glimpse of how the neighborhood changed as UMKC grew and spread out from its original site at 51st and Holmes. In 1904, two grain company heads, H.F. Hall and E.W. Shields, bought 38½ acres from Fifty-first to Fifth-fifth between Oak and Holmes. The previous owners had included August Meyer, president of the first Board of Park and Recreation Commissioners, who helped create the park and boulevard system. Meyer’s own mansion stood at 44th and Warwick on 8½ acres of land. When Meyers sold the 38-acre site to Hall and Shields, the Kansas City Star called the area Southwood Park, and described it as “beautifully wooded, high and slightly and approached by the new extension of Rockhill Road.” The two buyers said they planned to build homes for themselves on ten acres and subdivide the rest into five-acre tracts. A Sanborn Fire Insurance Map from 1930 – 1941. Hall built a large Georgian style home in 1910. It was one of the few homes in the city at the time to be built using fireproof construction. It had 14 rooms including four bathrooms and the first floor was finished in oak and mahogany. Herbert and Linda Hall left a $6 million bequest to establish a free public library on the grounds of their estate. 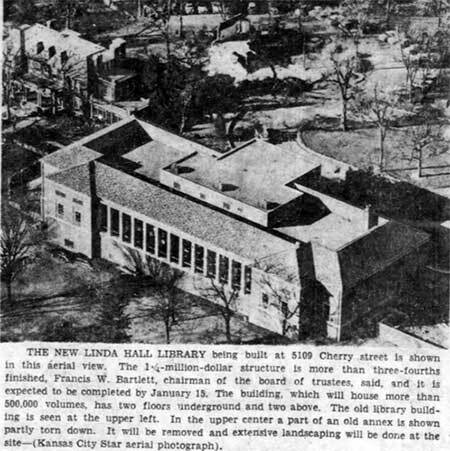 After they had died in 1941, a board of trustees decided to create a science and technology library, which opened in 1946 as the Linda Hall Library. The original design of Crestwood was created by landscape architects Hare and Hare. They broke with the traditional grid pattern to take advantage of the natural contours and trees, laying out curved roads and creating parklets with statuary or decorative touches where the roads intersected. Many homes in Crestwood incorporated into the foundations stone quarried at 55th and Oak Streets. The architecture followed the post-World War I Eclectic movement in design, with the majority of homes built in the Colonial Revival or Tudor Revival styles. Although Crestwood offered some smaller bungalows for young couples, many of its homes are larger. The uniformity of size, scale and materials gives the neighborhood its distinctive character. Frontage was often 45 to 60 feet and lots were 100 to 120 feet deep. The Kansas City Time, Nov. 24, 1955. The 1940s photos in the slideshow below show well-maintained lots and neatly-clipped hedges. This article only focused on the area that was historically called “Lower Crestwood” because of the topography of the subdivision. 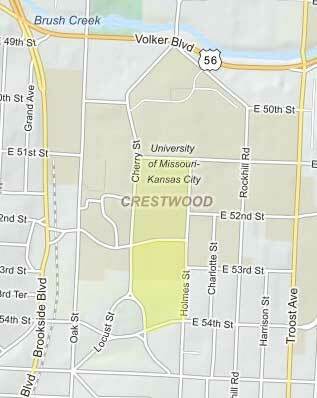 “Upper Crestwood is the part of the subdivision south of 55th to 56th where Kenwood becomes Crestwood Drive. In recent years, many residents of “Lower Crestwood” haven’t liked that historical name and now call it “Crestwood North” and “Crestwood South” for the areas divided by 55th Street. There is also a path historically called “The Bunny Trail” on Crestwood Drive, just a few houses north of 56th that leads to 55th Street and lower Crestwood. John: That’s great information. Thanks for sharing it.